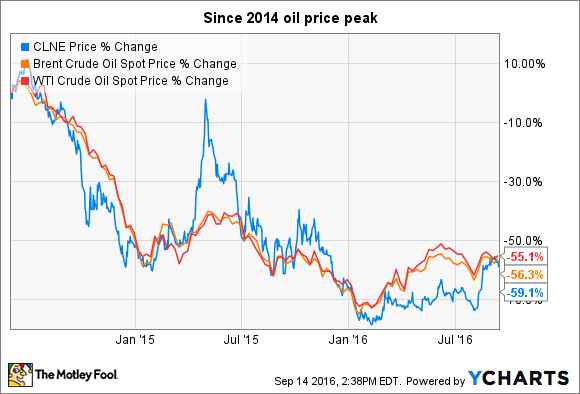 Clean Energy Fuels' stock has tracked oil prices for over two years now. But its business results have steadily outperformed its stock price over that time. Clean Energy Fuels doesn't deal in oil. But higher oil prices could be a boon for it. Image source: Getty Images. And while there is some logic behind this correlation -- Clean Energy's natural gas competes with oil-based fuels -- the market has largely ignored Clean Energy's steady growth and improved results, even as oil prices have stayed low. In other words, cheap oil hasn't hurt the company so far, and if you expect oil prices to continue climbing, then Clean Energy Fuels may very well be the best "oil" stock to buy today. In short, Clean Energy provides natural gas for transportation fuel to fleet operators, including solid waste, public transit, taxi, government, and heavy-duty transportation fleet operators. The company also builds and maintains both public and private stations for many of its customers, owns a compression equipment manufacturer, and owns a controlling stake in a business providing bulk volumes of compressed natural gas to off-the-grid industrial users. Cheaper fuel, which reduces operating expenses. Reduced emissions compared to those of oil-based fuels. This can be to meet regulatory requirements, benefit from tax incentives, or to meet corporate sustainability goals or requirements set by customers. The market has been voting against natural gas over the past couple of years, fearing that cheap oil -- specifically cheap diesel -- would eliminate the financial benefit for fleet operators of switching to natural gas-powered engines. The big concern has been the high incremental cost of natural gas engine and fuel systems, which can add tens of thousands of dollars in cost to the price of a vehicle. Since natural gas vehicles cost significantly more, fleet operators need to see enough fuel price savings to justify the higher vehicle cost, and there's no doubt that as the spread between natural gas and oil-based fuels has narrowed, the payback period to cover the higher vehicle cost has increased. Gallons delivered in millions, and gasoline-equivalent gallons. Data source: Clean Energy earnings releases. Oil prices consistently stayed above $90 per barrel from 2011 through the first half of 2014, before falling sharply in the second half of that year, and have stayed down since. But as you can see above, Clean Energy still reported double-digit growth in 2015. Growth has slowed somewhat this year, with the company reporting 8% growth in fuel sales to transportation customers in the first quarter and an 11% increase in the second quarter, but that's still nothing to sniff at, considering how many expected the company to face severe struggles if oil prices fell below $50. Instead, the company has steadily grown stronger, driving down operating expenses and improving its cash flows as incremental volume has added to the bottom line without driving up operating expenses. In many ways, Clean Energy has defied conventional wisdom, as fleet operators have continued to invest in natural gas vehicles to replace diesel trucks and buses, even if at slower rates in recent quarters. This has happened because natural gas has remained a cheaper fuel, but also because of the environmental benefits: With lower tailpipe emissions, both greenhouse gases and particulates that cause smog and local air pollution are reduced. But at the same time, higher oil prices will almost certainly drive faster adoption, since a bigger financial incentive will likely push more fleets to start making the switch. Furthermore, the market has shown itself quite willing to come back to Clean Energy Fuels when oil prices rise. So if you're bullish on oil prices climbing higher in the future, Clean Energy Fuels could be the ideal stock to own. The company would directly benefit from higher demand for natural gas as oil prices push gas and diesel fuel costs up. And even if oil prices don't start climbing soon, the company has proven more than capable of operating in the current environment.